From the kitchen of One Perfect Bite...We had a lovely dinner this evening. The folks at Hearst Ranch sent us samples of their delicious grass-fed flank steaks and they were the inspiration for tonight's border-style feast. A drawing, sponsored by the team at Foodie Blogroll, brought the steaks to our table. The first 25 people who entered the drawing "won" and I happened to get lucky. Be sure to check the Foodie Blogroll to see what other opportunities they have found for their members. 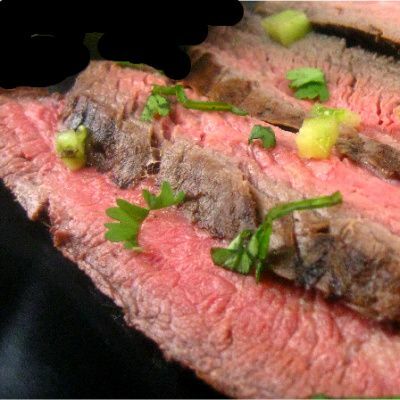 I love flank steak and wanted to use special recipes to make the most of this wonderful treat. We used the first of the steaks tonight in a spicy Southwestern creation that we really liked. I think you will too. Just a reminder that flank steak should be tenderized and cooked quickly. I used a jaccard to tenderize our steak and cooked it in a screaming-hot cast iron skillet for about 3 minutes per side. Cast iron retains heat and the steaks continued to cook as the meat rested. I let ours sit, tented in foil, for about 10 minutes before slicing the meat against the grain. Prior to cooking, I marinated the steak in a mixture of mashed chipotle chilies and lime juice. To cool the heat a bit, I made a sauce with Mexican crema (Mexican sour cream) and a mild salsa verde. It was one of those off-the-cuff combinations that really worked. The quality of this beef is amazing and I urge you to give Hearst Ranch meat a try. You won't be sorry. Here's the recipe I used for the first steak. I'll have another to share with you next week. 1) Combine mashed peppers and fresh lime juice in a blender jat. Puree. Pour into a pan large enough to hold flank steak. Turn to coat both sides with marinade, cover with plastic wrap and chill for 1 to 8 hours. 2) When ready to proceed, combine salsa verde, crema, milk and cilantro in a blender jar. Puree. Transfer contents to a small pot and heat very gently just to warm. Do not allow sauce to boil. 3) Scrape marinade from steak. Pat dry and season each side with salt and pepper. Heat a large cast iron skillet over high heat. Add vegetable oil and heat until smoking hot. Add flank steak and cook for 3 minutes per side. Remove pan from heat, but tent with foil and let rest for 10 minutes. Transfer steak to a cutting board and slice crosswise on the diagonal. Garnish if desired. Serve steak with creamy salsa verde. Yield: 3 to 4 servings. Love this!! I'll bet that was just delicious Mary. Wish I could get my husband to eat anything other than a near well done (overdone) steak. I'm working on moving him into the pink LOL!! Have a wonderful day. Congradulations on your win!! This looks cooked just perfectly, and so tender and juicy!! Dear Mary...thanks a bunch for clarifying the pressure cooker question for me- I guessed patience is the key to that soup! the steak is nicely done, this is what my husband will love. Oh! I love the idea of this creamy salsa verde. My husband and I love that version of salsa, and I can only imagine how great it must taste with some crema fresca stirred in. Thanks for sharing! My husband would be in love with this! Wow, what a great win. Looks like you did the steak justice too. Great looking recipe. The flank steaks look so juicy and tender! oh wow....my mouth is watering. SIZZLING steak...with CREAMY salsa verde...what a great combo! One hot and bold, the other cooling and rich...awesomeness! Congrats! You are indeed very lucky. Hope I'll get some of your luck :P Your steak looks juicy but I think I need it more cooked without any pink look. Have a nice day. Waw, Mary!! What a succulent looking steak!! Flank steak looks perfect ,juicy and delicious! The steaks look great but don't give an idea about the amazing flavors of either the marinade or that fantastic salsa! I'd love a taste or two! These flank steaks look very juicy. Unfortunately since I live where I live I cannot really have the chance to taste them. Nevertheless, the salsas you suggest will be in my things to do with other types of meat. Tragically the Hearst Ranch steak won't be available where I live in Australia, but the marinade & dressing sound sensational! What a lucky girl you were!! Flank steaks are wonderfulthough we are thrilled, since moving South, to be able to find and enjoy flat-irons too. If I could get This recipe looks great! Cooked to perfection! Pan broiling is such a great way to cook steak, and I've gotten some of my best results that way. All flavors I love - it has to be delicious. Mi piace la carne preparata in questo modo ! What a winner of a recipe. Flank steak is super flavorful and that sauce looks and sounds amazing! Done just the way we like it! those steaks look cooked to perfection! This looks yummy - cant wait to get back in the kitchen! Flank steak is by far my favorite cut of steak to eat! I usually make it with a red pepper sauce, but I would love to try your salsa sometime! This sounds delicious. Definitely a winner! Just got to thinking about when I would have had my first bit of flank steak. Teenager (16 or 17) - in a restaurant as a flank steak sandwich. Loved it. You've taught me a new word - jaccard. I just thought of it as that thing I poke the meat with. Congrats on the win! Your dish looks delicious and I must try it. Have a great day! Oh Mary... this one makes me drool. I love flank steak and Southwestern flavors so this one is calling my name. Looks wonderful Mary. That is exactly the way we like our steak; will to try wiht salsa verde. Mary you are so FAST. I was lucky enough to win the steaks too but won't be trying them out until Saturday (for the UT game - hook 'em:) They sure do look like a winner though - especially the way you prepared them. And thanks for the tip on flank steak - I thought I had remembered reading they were supposed to be cooked quickly - and now I know for sure. Thanks for sharing! Can't wait to see what you do with the other steak! We're glad you took part in the promotion and we are proud to have you as a member of the Foodie Blogroll. That looks amazing! I love the flavor combinations. That color = you cooked it perfectly. Your steak is cooked perfectly to my liking! I love the creamy salsa verde with it - scrumptious! That is the most gorgeous flank steak I have ever seen! I want to move in with you! and the creamy salsa verde sounds sooo delicious. This recipe is right up my alley with chipotles! You cooked it to perfection! I also received the same steaks and have to admit that I've never made flank steak before. I appreciate your suggestions on marinating and how to cook it. Now I feel ready to give it a try. Also, thanks so much for visiting my blog recently! I do hope you come back! Be sure to enter my Autumn Tea Giveaway, too. It's 4 or 5 posts down! It's only 5:45 here, so I need to get our dinner going. What a great prize! My husband would be thrilled! He loves his beef. We have marinated flank steak often. My favorite is the ends that tend to get a little more done and crispy. Lucky, wonderful you! You certainly know how to cook them up right! I love flank steaks. And you ahve reminded me that I don't check blogroll nearly enough. Wow this looks and sounds delicious! =) Great job as always! Are you kiddin me? This makes my mouth watered. I like the combination, such chef that you are, Mary. Wow, this looks incredible! Congratulations on your win!